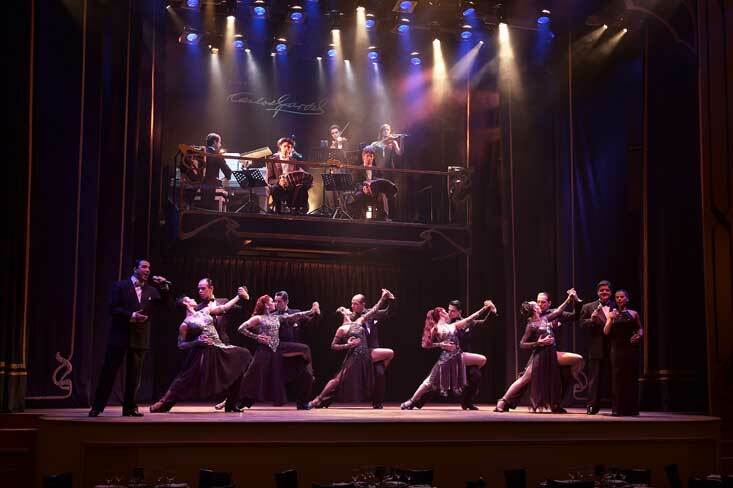 Buenos Aires, -the cradle of tango- as it is called, can be a superlative introduction to your exploration of Argentina. What is certain is that this cosmopolitan city, European in appearance, can keep any culture-oriented visitor busy indefinitely. Different aspects of its architecture and the diversity of its districts and suburbs reflect times of grandeur and plenty, cultural influences and migratory waves. Buenos Aires has been a true melting pot of native inhabitants, Spanish, Italian, British, French, German, Central European, Jewish, Arabian, Greek, Japanese and more recently, Chinese and Korean immigrants. It is evident that this city has a very active nightlife. An excellent opportunity for us to show you around the best tango and Argentine folk music. Day 1 - arrive Buenos Aires and transfer to hotel. Afternoon city tour, starting around 2pm. The tour is 3 hours long and visits the most important spots in the spectacular city of Buenos Aires. At the first stop you will discover the history of “May Square”, the site of the most important historical events and where their protagonists made history since its foundation where you can see its surroundings, the most emblematic buildings, and learn all about them. Then enjoy May Avenue and wonder in awe at the oldest residential neighborhood in Buenos Aires: San Telmo. Walk along its cobble-stoned streets and discover its antiques shops and picturesque buildings. Live and feel the original Tango in the neighborhood of La Boca: walk along “Caminito Street” and enjoy the dancers and souvenir shops. See the mythical Boca Juniors soccer stadium. Contemplate the modernization of the city whilst traveling along “Madero Port” and its exclusive docks, full of excellent restaurants and large office buildings. Pass through the Retiro neighborhood and move on to see Palermo and its most exclusive residential area before finally arriving at Recoleta. Once there, discover the final resting place of Eva Peron, “Evita” and wander through Recoleta Cemetery where she is to be found. Day 2 - breakfast, then full day Tigre and Delta tour. This group tour of Tigre is unique within the market due to the services and characteristics that it offers, such as the navigation of the channels in an excellent launch and lunch at an exclusive restaurant in the Delta.To start the tour you will be taken to San Isidro where you will visit the town’s historical center. Later the tour continues to the port in Tigre, where you will board the launch and navigate the best and most serene channels and streams of the Delta. After that you will enjoy an exquisite lunch at ‘Villa Julia’ restaurant, located in front of the river. At the end of the lunch you will visit the Puerto de Frutos where you can walk the market and other areas of Tigre. Day 3 - breakfast, then full day estancia visit. On this tour you will enjoy an authentic day in the countryside at an exclusive estancia in San Antonio de Areco. On arrival at San Antonio de Areco the group will take a tour of the village, which includes a walk around the historical downtown of the city. Afterwards the group will make their way to the exclusive ‘El Ombu de Areco’ Estancia. Once at the estancia the passengers can take rides on the horses or go for a ride in a “sulky” whilst enjoying a buffet with traditional cold cuts, cheeses and beverages. At lunchtime the group will enjoy a typical country style barbeque prepared using only the finest quality meats. Dessert is accompanied by a folklore show, which is followed by a demonstration of gaucho skills. Arrival and transfer from the International airport to the hotel. Afternoon visit of the city of Buenos Aires. The Four Balconies of Buenos Aires is an exclusive visit in which a guide, professor of the University, uses four parks and plazas to introduce passengers to the city, its history, its everyday life and the peculiar psychology of the "porteño", the inhabitant of Buenos Aires. Morning transfer to Tigre, the gateway small suburb to explore the Delta of the Parana River. Upon arrival, meet the guide from Selknam Canoas. We jump on beautifully hand made wooden canoes and will leisurely explore the delta navigating and paddling the small rivers and streams. A short snack is included. Return to Tigre. There will be leisure time to visit the small village, its market and then make own way back to Buenos Aires. (Our guide will offer information and details). Day at leisure until the time for the transfer to the airport (international or domestic airport). The hotel room will be available until the time for check out (normally around midday). THE FOUR BALCONIES OF BUENOS AIRES TOUR. An exclusive visit of Buenos Aires, in which a professor of the University, uses four parks and plazas of Buenos Aires (Plaza de Mayo, Parque Lezama and La Boca, Plaza San Martin and Recoleta) to introduce visitors to Argentina, its history, its contrasts, its contradictions and the characteristic psychology of the "porteños", the inhabitants of Buenos Aires. From the hotel we drive to La Boca, during the short trip- about 20 minutes- the guide makes a brief historical, geographical and sociological introduction to Argentina. Already in La Boca- the blue collar neighborhood of Buenos Aires, we walk Caminito Street and talk about the origin of Tango, we visit Necochea street where most of the brothels where tango originated were situated. We visit then San Telmo, the oldest "barrio" of Buenos Aires, where the city was founded for the first time in 1536, we walk Parque Lezama, Defensa Street, the Flee Market premises, Ezeiza Family House and San Lorenzo alley talking about the slave market, the arrival of the great European immigration, literature and British Invasions to the city during 1806 and 1807. Plaza de Mayo, Casa Rosada, the Metropolitan Cathedral and central part of the city is the next spot to be discovered and the correct moment to make a coffee brake at Cafe Tortoni opened in 1858 where Borges, Cortazar, Storni, Arlt, Sabato and many other writers used to talk, drink and write. Recoleta, the most aristocratic area of the city is then explored, the French architecture of most of the buildings surrounded by wide parks is where we spend some time, visiting the Cemetery founded 1822 where Eva Peron is buried. Between three and a half to four hours is the tour length. The melancholic romanticism of Argentina is clearly reflected by their most unique traditional music and dance: the Tango. In a three-hour lesson or practise Milena Braun, will introduce passengers to the world of tango and the first steps of this glamorous dance. Undiscovered Wines From Argentine Bodegas . Learn Terroirs, Varietals, Vinification . Tailored To Your Wine Tastes . Bilingual English + Spanish Speakers . Generous, Endless Pours. The Wine Tasting includes 5 glasses of exclusive Argentine wines unavailable in the USA, paired with 5 uniquely Argentine tapas. We do a specific pairing with each wine. Pairings usually include empanadas, cheeses, cold cuts, crackers, fruits, sorbet, chocolate, and perhaps nuts. Please inform us of your dietary restrictions and allergies. We do have vegetarian options. Book online! AMIA (Tuesdays and Thursdays in the morning): Paso Street Synagoge (visit); Walk across Once neighborhood, Libertad Street Synagoge (First congregation) with its Museum (subject to date and time); Commemorative Monuments of different historic episodes: Memoria Activa (AMIA bombing); Israel Embassy (bombing); La Memoria Park (in project). If you wish you could also visit Shoa Museum (Entrance: U$D 3 p/pax) which is not normally included in the itinerary as it is not representative of the Jewish experience in Argentina. Operates: Monday to Fridays. The best days to do this tour are Tuesdays and Thursdays in the morning as the passengers have the opportunity to visit the AMIA in the inside. The rest of the sites can be visited Monday-Friday.. And also, it is not recommended to do it on a Friday afternoon as almost all Jewish places are closed. Starting our "EVITA" tour at the recently opened Museo Evita in Palermo our target consists in offering our visitors an idea of her unique life from extremely humble origins in Los Toldos where she was born in 1919 up to the acme of her power till her death in 1952. Visit to the Museum in Lafinur Street where the whole Evita parafernalia is displayed; her legendary luxurious gowns, her days in the stage and screen, her meeting with General Juan Peron, her social works with her "grasitas" (working class people), her books and speeches, films and videos showing her at the Casa Rosada addressing the masses and images of her wake at the Parliament and later transportation by the streets of Buenos Aires. A 20-minute walk by Palermo Parks up to the National Library where the official residence of Peron and Evita was erected before it was put on fire and then put down. Arrival in Recoleta Cementery and visit to Eva Peron's mausoleum. A short drive to Plaza de Mayo, political core of Argentina since colonial times where you'll be at the scenery where most of her speeches took place from the balconies of Casa Rosada, the same from where Madonna addressed the multitude in Allan Parker's musical. A short walk along Avenida de Mayo up to café Tortoni, the oldest in the country, opened in 1858 on which premises functions the National Academy of Tango and where our guide will comment some of Evita's ideas and speeches. Getting to know Buenos Aires by bike is -without doubt the most interesting and entertaining way to explore and know the hidden corners of Buenos Aires. Departures: Daily at 0930 AM and 0200 PM. Children seats are available upon request. Notes: This route has been specially designed to avoid heavy traffic. When crossing a major intersection passengers are asked to walk the bikes. The route is designed for all levels of difficulty. What to wear: Comfortable clothes, layers suggested if cold, we highly suggest a light jacket. The Northern Residential of San Isidro and Tigre are ideal to enjoy a relaxing morning of afternoon by bike. This is a fun ride that starts in Plaza San Martin, to walk to the Train Station and get on the service to Tigre. Upon arrival ride in the area - the pier, the colorful local Markets, the museums and local rowing clubs. Then we jump on the train again to ride back to San Isidro where we get on the bikes and enjoy a smooth ride in the historic area, the fancy "Tren de la Costa ", ride by the river to the North till we reach Martinez a beautiful residential area where we get on the train again to return to Buenos Aires. This trip includes lots of contrasting areas, full of beautiful parks, riverside walks, nice residential areas. Departures: Daily at 0930 AM.